Most people don’t consider bullfighting to be animal friendly, especially not for the bull. 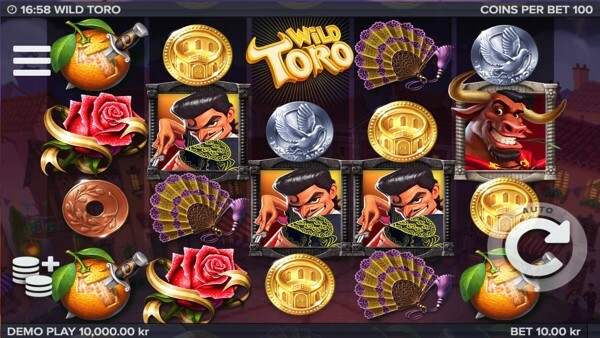 However, in the Wild Toro video slot, the bull is depicted as the hero of the story and will rampage across the reels while getting some well-deserved revenge on the matador. Developed by Elk Studios, Wild Toro is presented on 5 reels with four rows and 178 Ways to Win. The game does not feature any standard pay lines, so you simply need to line up matching symbols on adjacent reels that start forming from the left-hand side of the reels. The bonus features include wild symbols, walking wilds, re-spin challenge, and a top paying jackpot bonus worth 1,000 coins up for grabs. The background consists of a bird’s eye view where you will notice small houses with paper decorations and pink walls behind the reels. You will also find old-school lanterns scattered all over the place with little flags fluttering in the wind. Smoke comes out of various chimneys and clouds continuously move while you play. There is gentle flamenco music and sound effects of several voices in the background to accompany the setting of a small town somewhere in Spain. Wild Toro presents six themed symbols and includes a beautiful red rose, an orange stabbed by a knife, an ornate fan and bronze, silver and gold coins to complete the set of standard symbols. Wild Toro has an excellent variety of betting options that you can utilize before taking to the reels. The game features four unique betting options including jumper, booster, leveller, and optimizer. You can activate them and disable them as you please. The minimum you will be able to bet on a single spin is £0.20 while the maximum you can bet on a single spin is £100.00. The Wild Toro game logo acts as the wild symbol and will stand in for all standard symbols except the Matador and Toro bonus symbols. The Toro bonus symbol will only make an appearance on reel five and when its displayed will trigger the Walking Wild feature. The Toro bonus symbol will move left on the reels, one free re-spin at a time and will drop off the left-hand side of the reels. The Toro bonus symbol also acts as a wild symbol to assist you in creating more winning opportunities. This is activated by displaying three Matador scatter symbols anywhere in view on reels two, three and four. You are then given 3 free spins with the Matador scatter symbols frozen in place. Any additional scatter symbols displayed on the reels will award an extra free spin. The free spin feature ends when a Wild Toro appears on the screen or when the free spins are completed. Wild Toro is a state-of-the-art game featuring superb graphics and fantastic sound effects. The addition of two innovative bonus features makes this a truly fun and entertaining experience that you will struggle to leave alone once you start playing. The Return to Player has been set to 96.40% with a volatility level ranging between medium and high, giving you the perfect gaming experience that will feature decent prizes on a frequent basis. Wild Toro is a game by ELK Studio. A couple of popular casinos that offer games from ELK Studios are for instance Cashmio Casino and Casino Room.